¶ 1 Leave a comment on paragraph 1 0 For authors who have been invited to revise and resubmit their essays for the final manuscript, a copy of the current version has now been uploaded to this site, labeled “2012 revisions” in the title, and assigned to a password-protected WordPress account in the name of the lead author. Follow these directions (and view the video below) to revise your digital essay. All revisions must be completed by Friday, January 20, 2012, in order for us to review and include them with the final manuscript. If you have any questions about the instructions below, post a comment or email the editors. The editors have allocated a specific word count (including notes), which varies from essay to essay. If you are working with co-authors, remember that only the primary author, who owns the account, can make edits in WordPress. One option for co-editing is to copy and paste the HTML version of your essay into a shared Google Document, then paste the finished version back into your WordPress page. To see all comments on your essay on our WordPress/CommentPress site, go to the All Comments by section page (see symbols above Table of Contents) and click on your essay. You may copy and paste your comments into a new text file. You also may choose to print your essay (or create a PDF file) to view the entire text with comments listed at bottom, but our version of CommentPress accidentally prints the Table of Contents listing on top of your text. We will look into ways to fix this for future versions, but may not be able to correct it for the January 20th deadline. When revising your essay, bring our common theme on “writing history” to the forefront, as this is the thread that binds together all of our works. Make specific case studies and individual examples more meaningful by addressing broader questions on how and why we write about the past in the digital age. Also, take advantage of our online format by incorporating screenshots with links to sources, or open questions that invite public responses, into the body of your essay. Most importantly, as you finalize your essay, reflect on your writing process: does publishing your ideas in an open-review web-book influence how you write? ¶ 5 Leave a comment on paragraph 5 0 View our video tutorial on how to edit your Writing History essay in WordPress, with additional details explained below. 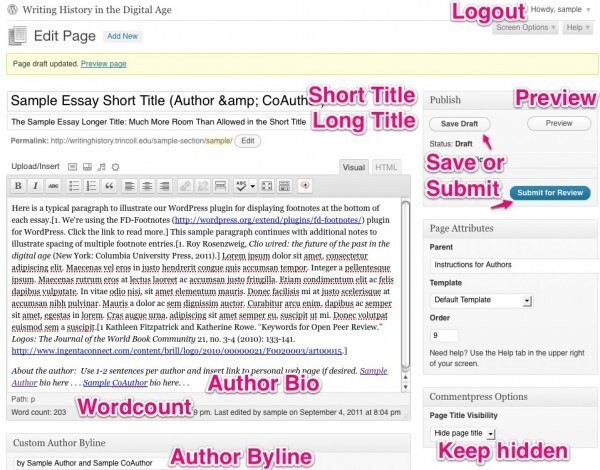 To edit your essay, log in with your assigned username & password for the Writing History site. If you need assistance, email the editors. ¶ 8 Leave a comment on paragraph 8 0 Go to the Dashboard and select Pages to view your draft essay, and click the title to begin editing. The Short Title is assigned by the editors to fit into the abbreviated online Table of Contents window. Please do NOT modify it, but feel free to email us if you wish to suggest a revision of a similar or shorter length. The short title will not appear on your essay page. The Long Title will appear at the top of your essay page, and you may modify it as you wish. The Author Byline should name all authors, and may be modified as you wish. When published, it will appear immediately below the Long title. The Author Bio will appear at the bottom of the main essay text. Please insert 1-2 sentences per author, with links to personal web pages if desired. Page Title Visibility should remain hidden, because this setting displays the Long Title in place of the Short Title on your published page. For the final manuscript, each essay has been allocated a specific Word Count (including notes). If your essay exceeds this number, we may either remove it from consideration for the volume or arbitrarily cut any text beyond the limit. The Save Draft button retains changes as you edit. Feel free to log out and log in again as you wish. The Preview button displays how your page will appear after it is published by the editors. ¶ 12 Leave a comment on paragraph 12 0 Click to view larger image in the same window. When editing your essay in WordPress, each paragraph stands as a separate block of text. Our CommentPress plugin uniquely identifies each block, so that readers may attach a comment to it. Prior to the deadline, you may add or delete any text you wish, but do not attempt to indent paragraphs. After the deadline, all of the essays will be “locked in” by the editors to avoid any conflicts with the commenting process. ¶ 15 Leave a comment on paragraph 15 0 To add more footnotes, be sure to follow the standard format: open-bracket, number, period, space, and the text of the note, followed by a closed-bracket. The space between the period and the text of the note is important! Be sure to use rectangular brackets to mark the beginning and end of your footnote, but do not insert them anywhere inside the text of the note. Instead, use parentheses “( )” inside the note. ¶ 16 Leave a comment on paragraph 16 0 When creating a new WordPress footnote, which number should you insert? In most cases, simply use the number “1”, as we have done for most of your essays. The plugin automatically displays all notes in numerical order (1, 2, 3. . .) at the bottom of the page, regardless of the number you insert inside the brackets. There is one exception: if you duplicate the text of any note (e.g. using “Ibid.” more than once), then assign it a new number (such as “2” ) to avoid confusing the plugin. ¶ 17 Leave a comment on paragraph 17 0 We rely upon the Chicago Manual of Style as our general guide, and we recommend using the free Zotero tool to manage your citations.1 At this stage, please do NOT insert a bibliography of sources at the end of your essay. After the open review period, if your essay is selected for the final manuscript, we will require authors to upload their bibliographies in Zotero format. ¶ 19 Leave a comment on paragraph 19 0 We encourage authors to insert links to external sites in their text and footnotes using the “link” tool above, with two reminders. First, if embedding a link in the main text, also add a footnote with additional source information and the full URL, to assist future readers if a link no longer functions. (For example, see the Chicago Manual of Style and Zotero links with footnotes above.) Second, when linking to an external site, add a brief title and check the box to open in a new tab/window, so that readers may easily return to the original page. ¶ 23 Leave a comment on paragraph 23 0 b) Insert your cursor in the text where the image should appear. To upload a copy of your image to the web, the simplest method is to load it directly to our WordPress site by using the Add Image button above the editing toolbar. Select the image from your hard drive to be uploaded to the Media Library. (Small images upload so quickly that you may not even realize that they’re done.) It is NOT necessary to press Save all changes. ¶ 25 Leave a comment on paragraph 25 0 c) Select the Media Library tab, scroll down to your desired image (it shows those uploaded by all contributors), and press Show. Caption is optional but recommended for source information. Also, if you choose to link the image to an external site, mention that source here. URL options: what should happen when the reader clicks on the image? 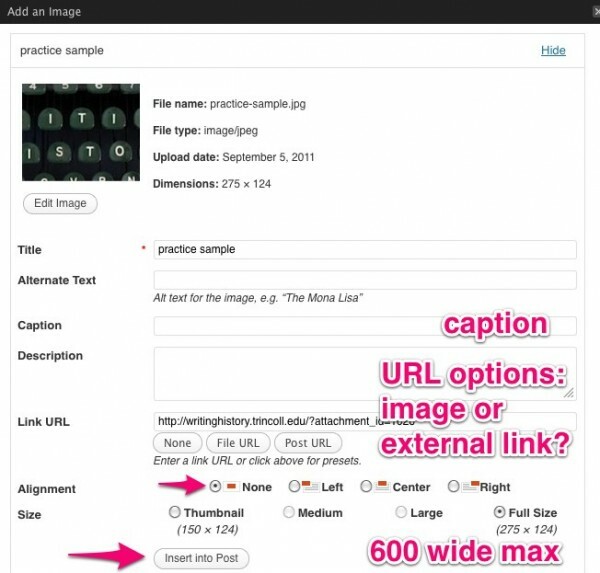 If you want the reader to see a larger version of the image, simply leave the default URL as-is. Or, if you want to reader to be sent to an external web page, insert the target URL here. Alignment: “None” is recommended, especially if you insert a caption. Size: The maximum width of images on our site is 600 pixels wide. If your image exceeds this limit, please choose either thumbnail, medium, or large (max 600), NOT full size. ¶ 32 Leave a comment on paragraph 32 0 f) To insert YouTube, Vimeo, or Flickr images or video into a WordPress page, simply insert the URL into the text of the page, which will automatically embed it. 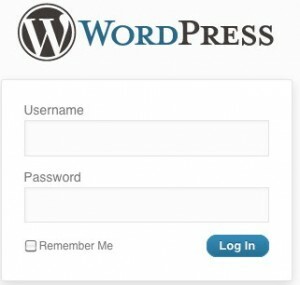 See more details at WordPress Codex on Embeds. ¶ 33 Leave a comment on paragraph 33 0 WordPress is one of the easiest tools to learn for editing web pages. Yet sometimes problems arise that can be difficult to solve. Please feel free to email the editors if you need assistance in preparing your essay. ¶ 34 Leave a comment on paragraph 34 0 If problems arise while editing your page, try switching from the Visual to the HTML view to identify the issue, or email the editors. Is there an easy mechanism for printing comments that I am missing? Even in the digital age, I need to print in order to visualize what I need to do to revise. Good question. I’ll add my tip about this to the “Updated instructions” section. Could you offer some clarification/guidance on the suggestions for incorporating references to other essays in the volume and/or comments offered on the drafts? I can see how to reference other essays in the volume–that’s a familiar enough exercise. But I am not sure I see an obvious way to talk about the comments, especially if we don’t know if they are going to be available to future readers. Should they go into footnotes only, or be incorporated into the main text as well if appropriate? How to cite them? (Commenter first and last name), on (author first and last name), “Essay and/or Page Title,” in Jack Dougherty and Kristen Nawrotzki, eds. Writing History in the Digital Age. Under contract with the University of Michigan Press. Web-book edition, Trinity College (CT), Fall 2011. http://WritingHistory.trincoll.edu. The 2011 web-book version of the volume — the one that underwent the open peer review, including all of the comments appended to it — will remain publicly available in perpetuity. Should the Press approve our final manuscript (a 2012 product), the Press’s digital and paper versions of that manuscript will coexist alongside the 2011 web-book version.